Publication Information: Crown Publishers, Crown Publishing Group, Random House Inc. 2014. 320 pages. Book Source: I received this book through the GoodReads First Reads program free of cost in exchange for an honest review. The book arrived as a paperback uncorrected proof. Favorite Quote: "People give a lot of fancy reasons for the things they do, but I've found it always comes downs to one of two things ... They're getting something for doing it, or they're avoiding something by doing it. Pleasure, or pain." The Moon Sisters is story a about siblings - the love and the hate and the rivalry between siblings. It is also a story about the parent-child relationship - how that can impact a person their whole lives through and how that can be completely different for two siblings. Olivia and Jazz Moon are two sisters living in a small rural town. Their mother has passed away. The question of whether it was a suicide or an accident is something they both deal with in their own way. Jazz is the older one, the practical one, and the one who feels that she never had her mother's love. Olivia is the younger one and the one who had the close bond with her mother. She suffers from synesthesia, a neurological condition in which stimuli to one sense trigger a response through the other senses. Olivia has the "ability to taste words and see sounds and smell a person on the sun." A third piece of the story is Beth, Jazz and Olivia's mother. Her story is revealed through the eyes of her daughters and through a stack of letters that Jazz finds hidden in her mother's room. Letters that Beth writes her estranged father. This is also the story of a journey - a physical one and an emotional one. Beth was a writer and told Olivia stories of the bogs and the ghosts and the lights. After her death, the nearly blind Olivia decides to take the trip to the bog for her mother. Jazz is forced to go along to protect and care for her. Along the way, the encounter and travel with train hoppers - people illegally hopping on board freight trains and living a traveling lifestyle. The books tells the story in the alternating voices of Jazz and Olivia interspersed with Beth's letters. The book begins strongly, slowly building the characters and slowly revealing the relationships between them. The alternating narrators work in this book because the readers does get to see both perspectives and feel both their emotions. By the middle of the book, however, it really slows down and seems a little repetitive in the emotions it conveys. Jazz had an unhappy relationship with her mother; Olivia was close to her mother. Jazz is practical and sensible; Olivia is impulsive. The characters surrounding them are caring but gruff and with their own secrets. Toward the end, the book does bring the characters and all the emotions to a closing - not an unexpected one but satisfying nevertheless. So good to begin, a little slow in the middle, and a satisfying ending. Publication Information: Viking Adult. 2014. 352 pages. Favorite Quote: "Art does not arise from a well of imaginary skill, obtained by dint of native ability. The sublime is a result of discipline. Art is earned by hard work, by the study of form by obsessive revision. And only then are you set free. Only then can you see." I Always Loved You is the story of the relationship between Edgar Degas and Mary Cassatt - a relationship that lasted over 40 years and ended with his death in 1917. Was it love? Was it friendship? Was it admiration? Was it a mentorship? Was it a complicated combination of all of those things? Please also see the reviews for The Painted Girls, which is the story involving one of Edgar Degas's models and Hare With Amber Eyes, a nonfiction account touching on those who admired and collected art. Mary Cassatt was an American woman who came to Paris in the 1860s to pursue her art. At that time, "success" on the European art scene was determined in large part by whether or not the artist was invited by the Paris Salon to exhibit. The organizers of the Salon judged and selected the artwork based on their definitions of what constituted "good" art. The Impressionist movement was in its infancy at that time and typically did not meet the Salon's approval. The Salon did not approve of their departure from tradition and their avant-garde work. Thus, a group of Impressionists held their own exhibition during the 1870s and 1880s. This group included Edgar Degas, Monet, Renoir, Manet, Cézanne, Berthe Morisot, others, and eventually Mary Cassatt. It is in this environment that Edgar Degas and Mary Cassatt meet. This book brings to life this world and gives the reader a peak at the people who are now considered the masters of their field. Many people have studied their relationship and attempted to reconstruct what it meant. People have written dissertations on it. The National Gallery of Art in Washington DC is curating a joint exhibition of their work later this year. The exhibition will focus on how each influenced the other's work. "You are to me what no other creature is. We are the same mind, Mary. We are the same soul, occupying two different bodies." "We are not," she said. "You are the only woman I can tolerate in the world." "Why would I flatter you? I respect you too much." "This is how you show your respect?" The book tells of their friendships, of their struggles, of their loves, and of the history behind the creation of some of the greatest Impressionist art pieces in the world. It speaks to the question, "Whether there was room for love in two lives already consumed by passion of another sort." A beautifully written story of what the history of this time was and what the relationship between the two might have been. Publication Information: PublicAffairs, Perseus Books Group. 2014. 240 pages. Book Source: I received this book through the GoodReads First Reads program free of cost in exchange for an honest review. The book arrived as a paperback advance reading copy. Favorite Quote: "It was what Pakistanis seemed to do best, coming back from the brink time and time again. Through tragedy and catastrophe, wars and floods, assassinations and police crackdowns, weak and corrupt leadership. the people of Pakistan knew only that they must keep marching on toward a better future." 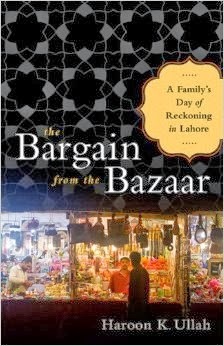 The Bargain from the Bazaar is the story of a country in turmoil told through the story of one family. Awais Reza is a shopkeeper in the thriving bazaar (market) of Anarkali in Lahore, Pakistan. Anarkali is the oldest surviving market in Lahore and one of the largest and oldest in South Asia. Awais Reza has survived "Partition" in which Pakistan was created. He has survived being a soldier in a war, being a prisoner of war, and walking a long and treacherous journey home from war. He is now a shopkeeper looking to a brighter future with his wife and his three sons - Salman, Daniyal, and Kamran. Then comes the Russian war in Afghanistan. Then comes American participation into that war. Then come the refugees into Pakistan. Then comes 9/11 and its worldwide repercussions. Then comes even more terrorism. This comes into an environment where economic instability, poverty, and corruption already run rampant. Admist this chaos are people - ordinary people like the Reza family - attempting to live their lives. They face the pull of economic tough times, the lack of opportunity, the respect for traditional values, the rise of modernism, and the countering rise of extremism. In this book, the three sons come to represent three routes the people of Pakistan are taking to move forward. Salman is the traditionalist, helping his father in the family business, upholding his values of honesty and family, and his responsibility as an older brother. Daniyal is the extremist, turning to a twisted view of religion, incorrectly convinced that the view he is being taught is the truth and that that is the only way. Kamran is the modernist, going to law school on a scholarship with the belief that education and working within the system is the way to change the future. Daniyal's choices put the entire family at risk. One person's bad decisions call the entire family's choices into question and puts them all in jeopardy. Fortunately, the system works enough to isolate his decisions from those of his family. Most realize that the extreme choices of a few do not represent the views of the many. That represents hope for this family, this community, and this country. This book does an excellent job of providing a story that goes behind the headlines that Pakistan seems to be in so often these days. This is the story of a family struggling in extreme circumstances. This is parents worrying for this children, especially when the children make catastrophic choices. This is young people trying to carve a life in different ways from the hand that they have been dealt. Things are not black and white. Communities and countries are not good or evil in their entirety. They are made of individuals - who make good and bad choices. In that, this story makes it personal - behind any headlines are so many stories like this one if we but take the time to understand. Publication Information: Penguin Group. 2013. 265 pages. Book Source: I read this book because it reminded me of the Politically Correct Bedtime Stories series of books, which were very funny to read as an adult and to read with kids. WARNING: This book is most definitely not for children. The jacket of this book describes it as "more than one hundred fairly tales, illustrated and reimagined for today." What I expected was a retelling of familiar stories using the format and language of today's media - tumblr, Facebook, tweets, Instagram, and more. Unfortunately, this book is not quite that. Tumblr is a social network and short form blogging platform. It allows users to create text and multimedia posts on private or public blogs. That, as the title suggests, is what the book does. Each set of two pages includes one illustration and some text. The books goes back and forth between different characters - Peter Pan, Cinderella, Alice in Wonderland, Sleeping Beauty, and Pinocchio to name a few. Unfortunately, the naming of the characters is about all this book has in common with the original fairy tales. The book does not retell the stories. It merely uses the names of the characters and creates "posts" about all kinds of very adult topics. Topics like doping in athletics, sexual preferences, sexting, depression, Internet addiction, and other topics of similar seriousness. Timely topics, but definitely not the stuff of fairy tales. The illustrations done in a sepia monochrome are interesting. Some of the posts are funny. For the most part though, it's not the book for me. Publication Information: Tarcher/Penguin, Penguin Group LLC. 2014. 124 pages. Book Source: I received this book through a publisher's giveaway free of cost in exchange for an honest review. The book arrived as a paperback uncorrected proof. Favorite Quote: "The ides of Less Doing is to reclaim your time and - more importantly - your mind, so you can do the things you want to do. Even little bits of time are important. It all adds up." The concept of Less Doing began as a set of productivity hacks and has led to the development of TED talks, online courses, and a coaching framework to help individuals and companies make the most of out of their time. 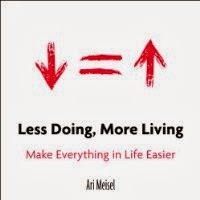 The author defines the keys to less doing as optimizing, automating, and outsourcing. The book goes through different tenets for each element and presents listings and descriptions of many tools that can be used in the process. The tools range from apps for your computer and electronic devices to virtual assistants to online shopping. This is a small and a short book. The physical book itself is about a seven inch square, and it is only 124 pages. That makes it a very quick read. It has a detailed table of contents and a cumulative list of resources presented by topic at the end. This leads to the books being a usable tool. The usefulness of the advice and the tools will vary from person to person depending on you particular situation. A reader may or may not agree with the paradigm presented. It really does not matter. This book has done the work of searching out useful tools for different productivity problems. That gives it its value regardless of whether or not you agree with the author's philosophy. So, use the book as a reference. Incorporate into your life what works for you and leave the rest. Publication Information: Houghton Mifflin Harcourt. 2013. 304 pages. Book Source: I read this book because of the intriguing title and description. Jess is a rising anthropologist in 1960s London. An affair with a married professor leaves Jess pregnant and her life forever changed. Anna is her "pure gold" baby, with "pure gold" being a euphemism for special needs. Anna has a lovely, happy, golden personality. Yet, her needs soon become the center of Jess's world. What's really odd about this book is that the narrator is not Jess and not Anna. This book is written as a first person narrative through the eyes of one of Jess's friends - another mother she meets in a playgroup for Anna. I am still puzzled by this choice as it creates a distance from the story. It becomes more of a lecture through life. The book also jumps over huge parts of Anna's life - from playgroup to when she is seven to when she is eleven and placed in a residential facility. The fact that the book wanders off on tangents also adds to this disjointed feel. The narrators speaks about changes over time to their neighborhood, about the definition and treatment of special needs at the time, about Jess's time in Africa, about anthropology, and about many other things. Many of these discussions are repeated several times during the book. I wandered through the book, skimming through the tangents and the repetitive parts. I walked away confused and with a feeling that I missed the point. Publication Information: Clarkson Potter/Publishers, Crown Publishing Group, Random House Inc. 2013. 256 pages. Giada's Feel Good Food is the seventh cookbook authored by Emmy Award winning Food Network star Giada de Laurentiis. This book is intended to be broader than a cookbook; it includes tips from Giada about diet, exercise, and other self-care routines. Interesting and more personal, as seems to be her brand. The book is organized into sections around meals - breakfast, lunch, snacks, and dinner. The only exception is that juices/smoothies and desserts have their own section. The start of each section includes a list of the recipes in that section. The book also includes a detailed index which is helpful. The physical book is a good size - not so large as to be unwieldy, not so small as to crowd the recipes. The book lays flat when opened - important to me because I lay out the recipe on the counter and constantly refer back as I follow the recipe. Each recipe is concisely presented on a page. The ingredient list for each recipe is clearly marked and easy to read. The ingredients for the recipes seems to be things readily available to the home cook. Each recipe include nutritional information. Each recipe includes tags to indicate if its is vegetarian, vegan, gluten free, and/or dairy free. The book has color illustrations. Not every recipe includes a picture. The instructions for each recipe are preceded by an introductory personal note - interesting if I am reading the book, completely unnecessary for the recipe. Several pictures of Giada appear throughout the book. I understand the reason for them, but I could do without them. Overall, a usable cookbook with practical recipes and a good addition to my cookbook collection. Publication Information: Knopf Books For Young Readers. 2014. 304 pages. Favorite Quote: "Talking about my world, seeing its distorted, fun-house-mirror reflection in the eyes of these American acquaintances, is okay. Their perspective is now mine, and my reality is not theirs. But somewhere between our differences is a shared space where we are friends." Laila is a princess, the daughter of a king. Or so she thinks. The kingdom is never named; yet, from the names and the descriptions, it is clear that it is a Middle East nation. After the assassination of her father, she, her mother, and her six year old brother are whisked away and relocated to the United States. Here, they struggle to reassemble their lives. Laila is a teenager trying to fit in to her new community - friends, boys, and the high school social scene. In that, she faces the same struggles that every teen faces - mean girls, friends who have their own issues, the fear of being "different." Laila struggles to find her place, "It seems I can only convey a world to them that sounds either much worse or much better than mine actually is. Was." She also meets Amir, who is close to her age and from a small village in her home country. In their attempt to find a new place to belong and to fit in, they are the same. However, Amir's family and his home have been ravaged by the actions of Laila's father. In that, they are polar opposites. How does she reconcile that simultaneous bond and divide? In addition, Laila is caught up in political maneuverings - from Laila's mother, from the US operatives responsible for their relocation, from people like Amir who have also relocated from the same country but who sit on the opposite side of the political fence, and from her own uncle who was responsible for her father's death. Her confusion and her desire to do the right thing carry through the entire book and lead to a powerful ending. As an adult, I really enjoyed this book. It does a good job of capturing the experience of someone new to this country. It captures that pull of a new home and of the culture left behind. It also tells a story that goes behind the headlines. Political leaders around the world end up in positive and negative headlines, but what of those who surround them and those who love them? One of the biggest eye-opening experiences for Laila is to think about her father not as the one who loved her and who played with her but as the one who was a dictator and caused harm to so many. Laila's mother points out, "Remember this, Laila. No matter what you hear about your father, no matter what happens, remember that he was the one who had faith in you and love for you when no one else did." Throughout the book, Laila tries to reconcile that vision with the other reality of her father who was a tyrant responsible for the death and destruction of so many families. My biggest concern with this book is the suggested age of the target audience. To me, this is an adult book with very adult topics of loss, politics, and difficult choices. Will the target audience of pre-teen and young adult readers be able to understand the story the book is telling? An adult reader may catch the references and understand the "back story" even though no names are named in this book and no locations are specified. That is what gives the story and the characters depth. Will a young reader have that knowledge or understanding? The book does include a commentary and a list of online resources at the end, which again are written for an adult audience. I don't know how many young readers will read the commentary or even care to. Without that understanding, what will the target reader leave this book with? Will a young reader focus on the sometimes violent political machinations and the differences? Or will young reader leave this book with a realization that people, no matter where they are from, are the same with similar emotions and struggles and needs? As Laila and her new friends find, "A friend is a friend in any language." For that impressionable age, I would like the focus on the similarities to be much stronger and much clearer. Otherwise, the book will serve only to build on the stereotypes and prejudices found in the media these days. Truly, the book should be marketed to a different, more adult audience. Publication Information: Viking, Penguin Group, Penguin Random House Company. 2014. 373 pages. Book Source: I read this book based on how much I enjoyed the author's earlier book, The Secret Life of Bees. Favorite Quote: "Be careful, you can get enslaved twice, once in your body and once in your mind." Note: In doing research on this book, I have learned that there are multiple editions of this book - with and without annotations from Oprah Winfrey. I read the one without annotations. The Invention of Wings is a fictionalized account of the lives of the Grimke sisters. Sarah and Nina Grimke were born into a slave holding family in the heart of Charleston. Their father was a judge and a plantation owner who upheld slavery laws and believed that the woman's place was in the home. The Grimke sisters went on become early proponents of abolition and women's rights. As a counterpoint to the Grimke sisters, the author has created the character of Hettie or Handful, a slave girl in the Grimke household. On Sarah's birthday one year, her parents give her Handful for her own personal slave. The book is told in the alternating voices of Sarah and Handful. Sarah's journey is one of fighting against convention, against the society into which she is born, and against her own family to find her voice. As her mother once tells Sarah, "The truth is that every girl must have ambition knocked out of her for her own good. You are unusual only in your determination to fight what is inevitable. You resisted and so it came to this, to being broken like a horse." Sarah journey takes her away from Charleston to the Quaker north and back again to her hometown even though she finds herself not welcome there. She starts what she believes is a fight for abolition, but finds that it is much more than that. "It has come as a great revelation to me that abolition is different than the desire for racial equality." Handful's journey is one of trying to find some modicum of control and freedom in a life where neither seem possible. As her mother tells her, "Ain't nobody can write down in a book what you worth." She learns to survive the hard blows life deals her - her mother's disappearance, punishments "for her own good", loss of those she loves. She find her own way out, "I have one mind for the master to see. I have another mind for what I know is me." I really enjoyed this book and read it almost straight through. I like the counterpoint of the two characters. I did not realize that it was based on actual historical figures until I was well into the book. I found myself then doing research because the author did such a good job of generating and holding my interest in the characters. I wanted to know more about the Grimke sisters and what happened to them. I also left the book wishing I could find out more about Hettie and what happened to her - and her individual character did not actually exist. I was sad when the book ended because I was not ready to let go of the story or the characters. Publication Information: Simon & Schuster. 2014. 263 pages. Book Source: I read this book after reading a description of it on GoodReads. Favorite Quote: "Norma Bowe often said she believed there was a wonder in unleashing your story, horrible as it might be, out into the world. ... Give it voice, and you never know what kind of gift might find its way back in return." Dr. Norma Bowe is a nurse turned college professor. She teaches at Kean University in New Jersey. Her most popular class is titled "Death in Perspective." The Kean University catalog course description reads as follows: "The past, present and future individual and societal concepts of dying, death and bereavement, death education, and exploration of related ethical issues. A field trip is required." The class has a three year waiting list. Erika Hayasaki is an assistant professor at University of California Irvine. Before that, she spent almost a decade reporting on breaking stories for the LA Times - story such as terrorist attacks, university and school shootings, and others involving death and destruction. She learned about Dr. Bowe's class and spent the next three years becoming a part of the class and following Dr. Bowe and the students in the class. This book is a culmination of that research. This book is not a textbook description of the class. Rather, it is an account of the personal journeys of the author, Dr. Bowe, and some of the students in the class. As the author points out, those who sign up for this class usually do so for some specific reason - something unresolved in their lives that they need to deal with. There is Jonathon who lost his mother to murder and his father to prison, and who is trying to hold his brother close as the only family he has left. There is Caitlin who is repeatedly told she was an unwanted child and who constantly battles to save her drug-addicted mother. There is Israel who escapes a life and possibly a violent death in the gangs. There is Carl who is serving a long prison sentence. There is Isis, who is a young teen with no one to rely on except for herself. There is Dr. Bowe herself and the reasons that bring her to teach this topic. If you could eliminate one disease from the planet, which would you choose and why? Write a good-bye letter to someone you have lost. How do the stories of who we are survive our death? The structure of the book leads the reader through the class but through the experiences of the individuals. As the author points out, "That was why attending one of Norma's classes often felt like having a front-row seat at a one-woman monologue, interspersed with improv moments drawn from audience participation; she could build an entire lesson out of one student's personal experience. You never knew what to expect from the show or its spectators. Some days it was laughter; other days, rage or tears." Interestingly, a book and a class with "death" in the title ends up being a testament to survival and life. "Adulthood, Norma believed, is about giving back and passing lessons on to the next generation, so that the virtues you work so hard to develop live on even after your death. Norma came to embrace the idea ..... this period .... comes down to questions such as: What is my legacy? What will I leave behind for the next generation?" I was completely pulled into the individual stories and the application of the ideas to my own life. Fortunately, my life experiences are relatively safe and calm. However, all of us including me experience loss and can relate to those emotions and can learn to express and process those feelings in a healthy way. Maybe I will put myself on the wait list for this class. In the meantime, I will continue to think about this book for a long time to come. Maybe I will re-read it to learn more. And then maybe reread it again. Publication Information: Random House. 2013. 448 pages. Book Source: I received this book through the GoodReads First Reads program free of cost in exchange for an honest review. The book arrived as an autographed hardcover edition! Thank you GoodReads! Favorite Quote: "We do die, some sooner than others, and we should try our best to say the things that might mean something before that day does arrive." & Sons begins with a funeral. Philip Topping's father Charles has died. The buzz at the funeral is the fact that one of Charles' oldest friends, the reclusive author Andrew Newbold Dyer, is to give the eulogy. He attempts to do, but unsuccessfully so. From there, the book moves both forward and backwards. The book looks back, in particular at the friendship between Charles Topping and Dyers. What starts as a school boy friendship shifts and changes over the years; yet, it stands the test of time and lasts until Charles' death. Or does it? It carries over into the next generation with their sons. Or does it? Moving forward after the funeral, Dyer attempts to gather his three sons together in reconciliation to gather the moments of his life. Through an odd set of circumstances, Philip Topping ends up living in the Dyer household. The next week brings out the stories and long-held feelings of these characters towards each other. There is a lot going on in this book. There is the somewhat mysterious character of A N Dyer. There is his relationship with his three sons and their mothers. There is the relationship between the brothers. There is the long standing friendship between Charles Topping and A N Dyer. There is the character of Philip Topping (Charles' son) and his complicated relationship with his family and with the Dyer family. There is the private boarding school that plays a large role in the lives of many of the characters. There is A N Dyer's book Ampersand which becomes yet another character in the book. In other words, there is a lot going on. What complicates matters further is the choice of narrator. Philip Topping tells the story. Some situations in which he is involved are told in the first person. Other situations are described through him; yet, he was not there and could not have had knowledge. Also, his role as narrator confuses me as to the main focus of the book - is it the relationship between Dyer and these young men or is it the impact on these young men of the history of Dyer and Charles' friendship? The symbolism of the ampersand recurs several times in the books. It is the name of Dyer's most famous book. His initial spell "AND". The story is one of relationships - many relationships between once character and another. The ending took me by surprise and leaves a lot of open questions. Having read it, I am not quite sure what to make of this book. Not quite sure where it was going. Not quite sure that I really want to know. Publication Information: Hazeldon. 2010. 160 pages. Book Source: I found this book while browsing in a bookstore. Favorite Quote: "Owning our story and loving ourselves through that process is the bravest thing that we will ever do." The caption to the title of this book says, "Let go of who you think you're supposed to be and embrace who you are." A true idea and good advice. Hence, I was prompted to read the book. Dr. Brene Brown is a research professor and public speaker whose work centers around the feelings of shame and worthiness. Her research is based on an approach known as Grounded Theory - to begin without pre-conceptions and to let the data drive the patterns. This book emerges out of that research as she identified commonalities in individual stories of people's lives. The book introduces the concept of "wholeheartedness" and presents a guidebook on wholehearted living. The book is not a "how to" but rather a "what to" do. It is organized around ten ideas or guideposts to develop a wholehearted approach to living. The guides are presented in the positive behaviors to cultivate and the negative behaviors of which to let go. The positive behaviors include authenticity, self-compassion, resilience, gratitude, joy, intuition, play, calm, laughter, and others. A familiar list and one most people will agree with. For that, I appreciate the book. I find it meaningful to give myself periodic reminders of these ideas. Where the book lacks for me is in the way it is written. Dr. Brown presents the book as a first person account through her journey of discovery. I find examples and "real life" scenarios are necessary to help ground a book such as this one. In this case, however, the ideas of the book and the personal story seems to compete to be the focal point of the book. So, while the ideas are interesting and her personal story could be interesting, I find myself unable to fully focus on either one. I appreciate the reminders and I appreciate her story, just perhaps separately.